I'm still on the look-out on sourcing some Kona Cotton locally. I tried to email my favorite fabric store on the lower mainland, Fabricana about getting shipped some, but haven't heard back from them yet. Boo erns. I did get a tip about a new quilting store in the downtown area here, so I'm thinking I must check that out. Maybe tomorrow, if Kole will let me. I also heard that it was quite a pricey store, so I guess I'll have to see for myself if it's worth it or not. 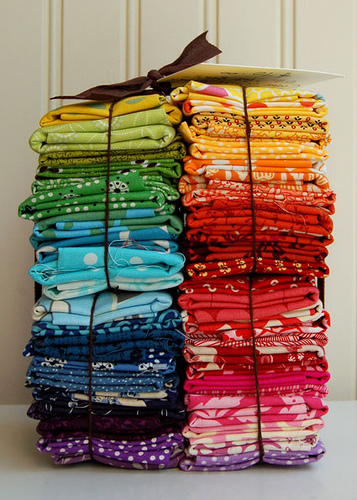 I was told that my highly sought after Kona Cotton was priced close to $15 a meter! At Fabricana that stuff is $8 a meter! Eep! I'm keeping my fingers crossed that this person got their information wrong. 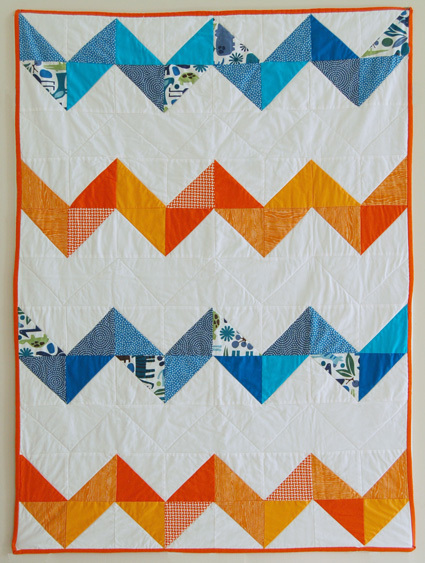 This is the Zig Zag quilt that I saw on the The Purl Bee blog. Ever since I saw this, I knew I wanted to make it for Kole. I've been wanting to make Kole a quilt since the day he was born, but even more so now that I found out that we're not allowed to paint our place! Yes, our place is a rental, but a no painting rule?? Supposedly my building's management company has had way too many ex-tenants paint their place crazy colors and then move out months later, leaving the company the pains of trying to paint over blood red or something like that. So now I have to find new ways of decorating Kole's bedroom without the use of paint. Even though he can't use the quilt now, I figured I could use it as a room accessory and drape it over the rocking chair or have it folded on the rocking ottoman - both of which I need to make cushion covers for...in the color theme I've picked out, of course. 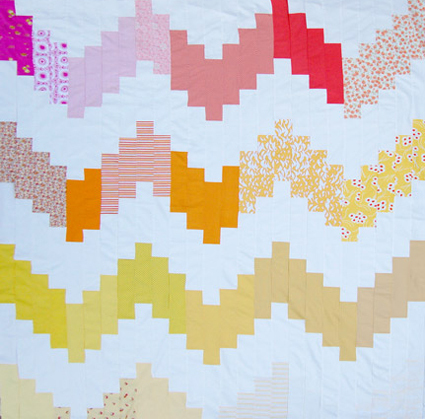 I would love to make this quilt in the colors used by the creator too, as it doesn't scream baby or anything like that. Kole will be able to use the quilt when he's older, and who knows, may even have it when he's an adult and can pass it down to his own child. If I can't find adequate orange fabric, my fall back color is brown. I think blue and brown is a new favorite pairing for me. Actually, anything with brown has become a new favorite. Which is weird, as I'm definitely not a brown person. 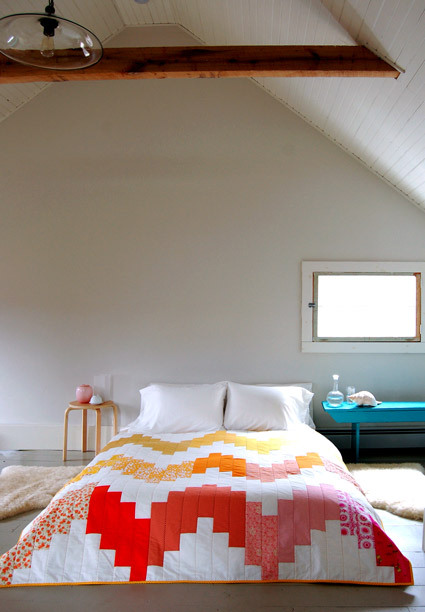 Pink is my favorite color, and is what caught my attention when I saw this quilt. Yet further inspection of the pictures shows that there really isn't that much pink in there. It's more yellow than pink. Which makes me think that the possibility of Brett letting me put this on the bed will be quite high. I guess it's fair to say that my new hobby is quilting. 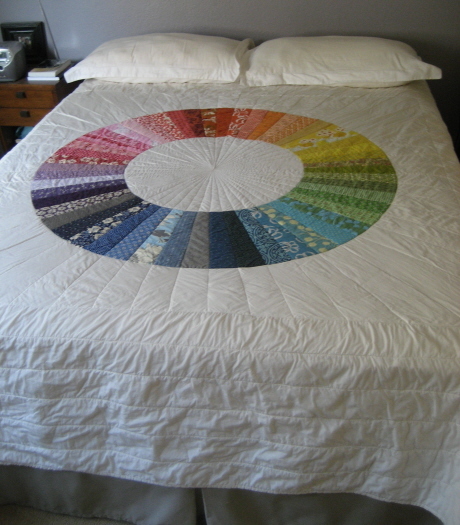 Well, will be, since I have yet to quilt anything! I'm determined to have a closet full of blankets, whether they be quilts, crocheted afghans, or knitted throws. I just want a closet full of cozy blankets. I'm always so cold, and now that we have to pay for our own heating bill, we've only been putting the heat on in the living room, since that's where most of the living is done in our place. I guess we'll see if my vision of coziness will come true. Have you tried the Creation Station in California? They ship everywhere, and their prices are great. Wow! 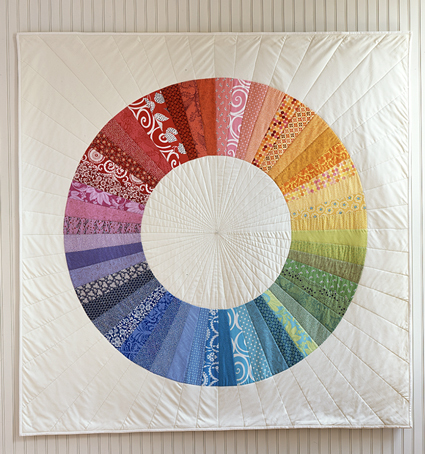 Those quilts are so pretty- I especially love the 'wedding quilt'. just make sure he doesn't puke on it. babies seem to like to puke a lot from what i hear. what colour are the walls in kole's room? wall vinyl/ wall stickers might be cute. Cherri - Thanks for the tip! I took a peek at their website and wow! The prices are great! Steph - yes, babies puke a lot! I can no longer wear nice clothes cause Kole always manages to miss the burp cloth/blanket and get his puke all over my arm/legs. If he doesn't get my clothes, then it's on my neck or the side of my face! All the walls to our place is a generic beige color. I was thinking of some wall vinyls for the kitchen and possibly the living room. I was planning on using some that I saw on etsy for Kole's room, but then decided to try out the embroidery hoop idea, using the color scheme I had in mind. I'm determined to make the wedding quilt!! I'll let you know how that goes!